Let’s get this out of the way before I start: I love Bojack Horseman, and I’m not accusing the show of being a Simpsons ripoff. You don’t need to point out that some of these jokes are older than The Simpsons, and might possibly be inspired by something other than the Simpsons. I know. 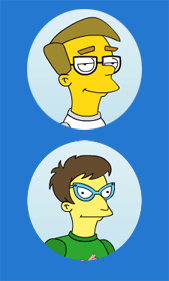 I’m just having fun looking at the similarities between two of my favorite shows. Bojack Horseman creator Raphael Bob-Waksberg is clearly a fan of the Simpsons, though, so I’d wager that some of this isn’t a coincidence. Season 4 of Bojack Horseman was amazing! Rather than devouring it in one night like we did with season 3, J and I watched two episodes a night until we had seen all 12. And, because I see Simpsons references everywhere, I couldn’t help but catalog the scenes that may have been inspired by the Simpsons. Yes, yes, I know that this is based on a Schoolhouse Rock parody! This information is not news! Maybe other shows do Schoolhouse Rock parodies? We don’t know, frankly we don’t want to know, it’s a market we can do without*. Anyway, what are the odds that two shows I watch would parody the same segment? Maybe it was just a campy 70’s throwback to appeal to Generation Xers. 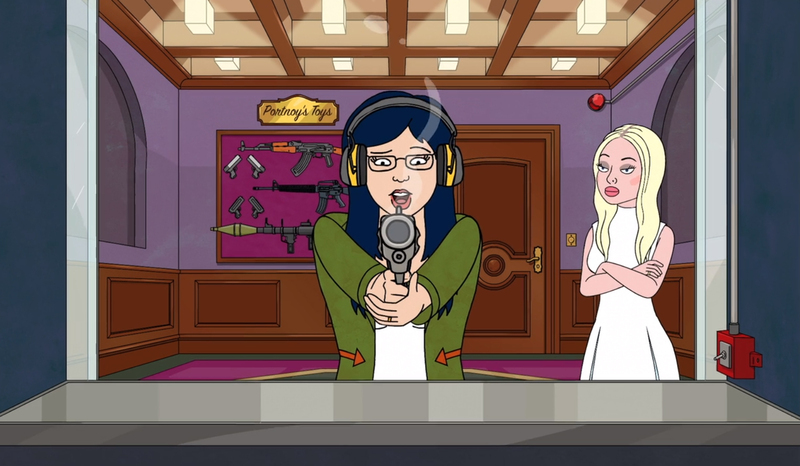 In this episode, Diane develops a love of handguns after Courtney Portnoy, a starlet she interviews, uses one to stop a predatory and racist harasser from “badgering” them. It’s a similar setup to The Simpsons, Season 9’s The Cartridge Family, but what comes next really hits the reference home. 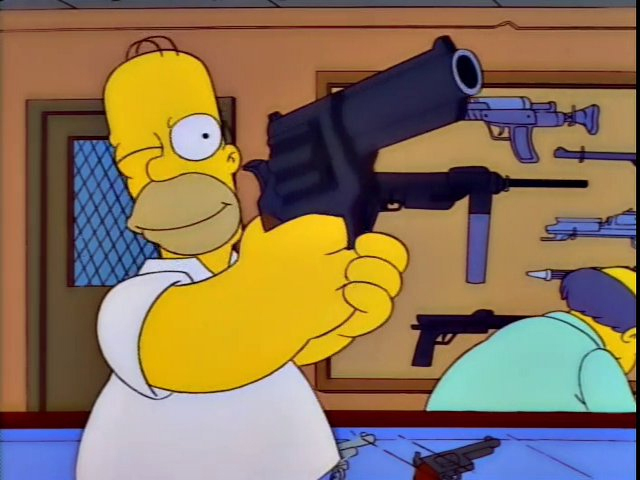 As you recall, in The Cartridge Family, when Homer enters the Kwik-E-Mart with his gun, Apu thinks he is being robbed. Homer imagines the life of wealth and success he would lead if he robbed the Kwik-E-Mart, but when he comes out of his fantasy, he is disappointed to realize that he has bought a hot dog and left without harming anyone. In Thoughts and Prayers, Diane gets home and is shocked to realize that she has been holding a gun for a long time without meaning to, and that she probably robbed a convenience store by accident. Well, she is married to a handsome movie star who lives in a mansion, so maybe Homer’s fantasy was accurate! Bojack is clearly an aggressive driver. Is it possible that he was forced to watch the same driving school video that Marge did in Season 10’s Screaming Yellow Honkers? Were those all the crossover Simpson jokes from season four of Bojack Horseman? Probably not, but those are the ones I caught. Thank you Simpsons for helping inspire eclectic cross-referential humor, and thank you Raphael Bob-Waksberg for taking it to the next level and creating a show that earns its laugh out loud jokes by bringing along soul scorching emotional depth. *Actually, we do know, there have been plenty of Schoolhouse Rock parodies. This entry was posted in Contemporary, Cultural Impact, TV and tagged Bojack, Bojack Horseman, Cartoons, Classic Simpsons, Netflix, schoolhouse rock, the Simpsons, TV. Bookmark the permalink.